Rob Kiser|Call Photo Covington’s Claudia Harrington makes a move to the basket against Bethel Thursday. 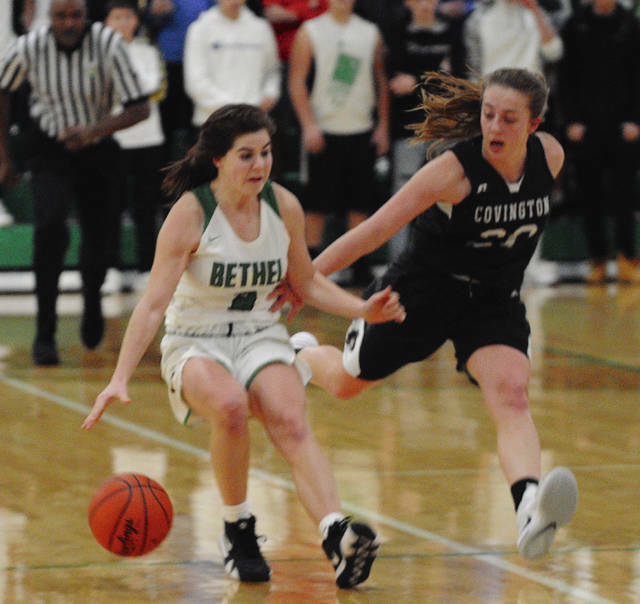 Rob Kiser|Call Photo Bethel’s Olivia Rettinger is pressured by Covington’s Morgan Kimmel Thursday night at Bethel. Ben Robinson|GoBuccs.com photo Covington’s Lillian Hamilton showed amazing courage this week. 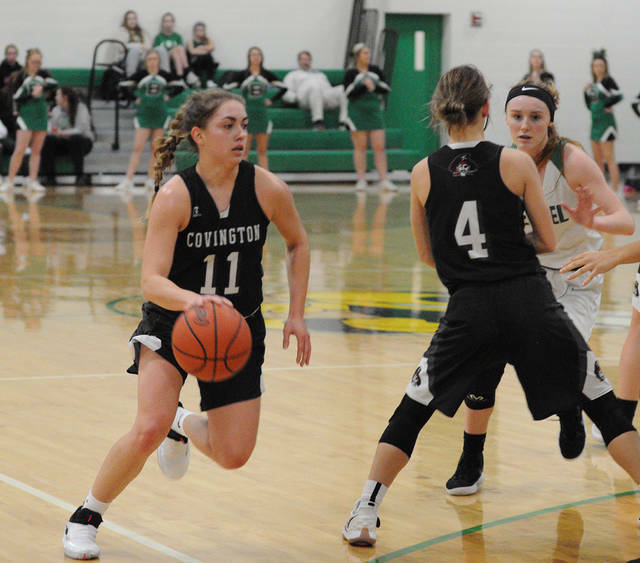 BRANDT — In a normal week, following a big win over Russia with a road win in the CCC over Bethel would be a pretty good week for the Covington girls basketball team. But, this has been anything but a normal week at Covington. So, what took place on the gym floor paled in comparison to what transpired outside the gym doors. On Monday morning, the Hamilton family suffered something no one should have to go through. Covington senior Lillian Hamilton, sophomore Jakob Hamilton, younger brother Joesph Hamilton and their mother Katie Hamilton lost their father and husband John “Matt” Matthew Hamilton to an unexpected death at the age of 42. “It has been a rough week for us,” Covington girls basketball coach Jim Meyer said after the Buccs 42-29 win over the Bees Thursday night. And, as those familiar with Covington would expect, the team and community have rallied around the Hamiltons. Lillian plays for the Covington girls and Jakob plays for the Covington boys. And with the Russia game scheduled for Tuesday, Lillian showed tremendous courage, insisting that the game go on so she could play for her dad. But, those feelings are for his entire team as well. As for the game itself, Covington saw the defense they know they will see after Tri-Village’s success last week. Bethel went to a triangle-and-two with both girls on Sammi Whiteman. “We know we are going to see that defense a lot now,” Meyer said. 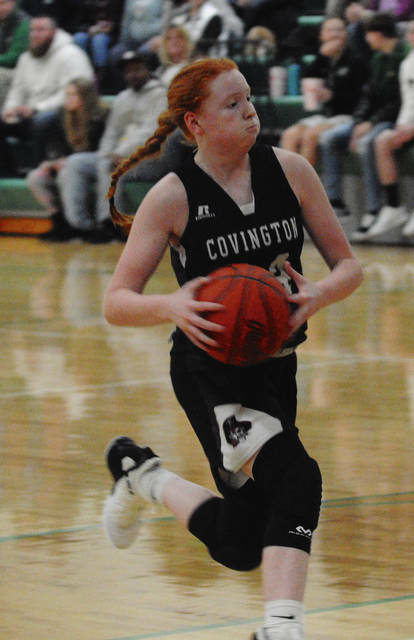 But, unlike the Tri-Village game, Whiteman found a way to score 16 points in the opening half as Covington jumped out to a 23-4 lead and led 29-10 at the break. While Bethel outpointed Covington 19-13 in the second half, the Bees could never get closer than the final margin. One key for Covington was 47 rebounds, including 20 offensive rebounds. Neither team had a lot of success at the foul line, particularly Bethel. Covington, 14-2 overall and 8-1 in the CCC, trails Tri-Village by one game. 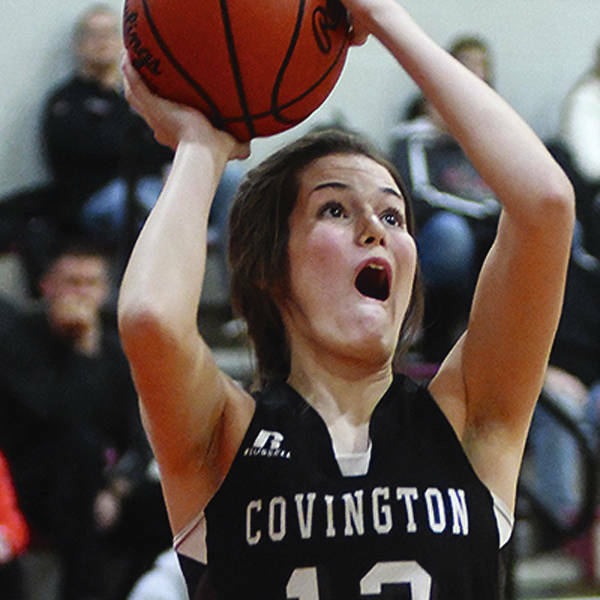 Whiteman led Covington with 22 points and Morgan Lowe hit a couple big threes and finished with eight points. Bethel dropped to 9-7 overall and 3-6 in the CCC with the loss. 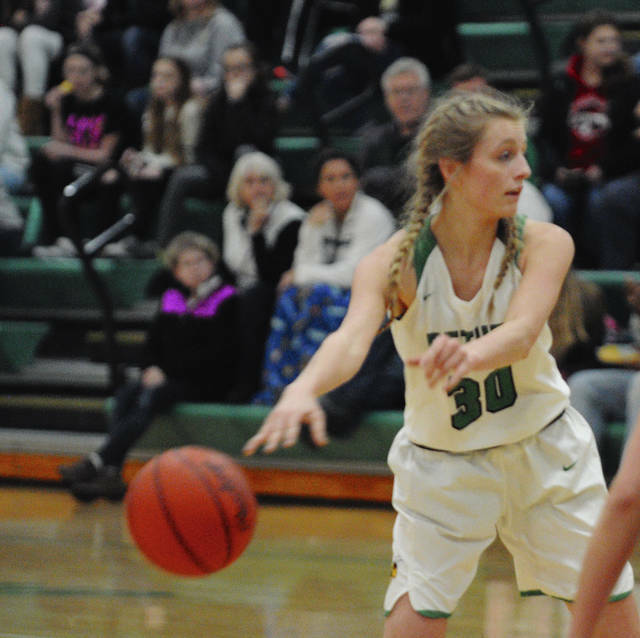 Natalie Moorman led the Bees with nine points and Claudia Lowery added five. Covington will play Greenville Monday, while Bethel hosts Piqua the same night. “This team has shown so much character,” Meyer said about his squad. And it had everything to do with what has gone on outside the gym doors, not inside them. 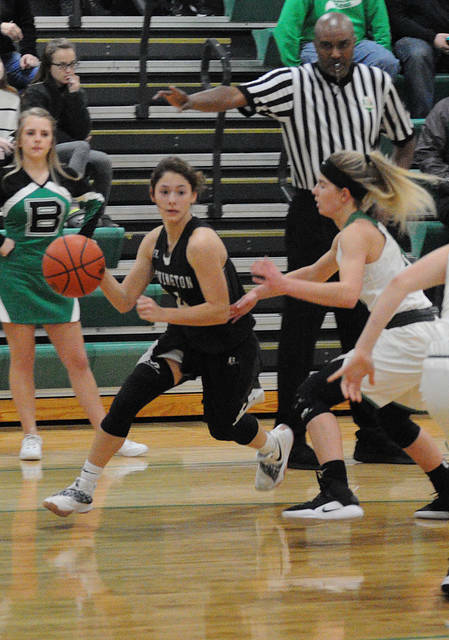 https://www.dailycall.com/wp-content/uploads/sites/30/2019/01/web1_claudia-2.jpgRob Kiser|Call Photo Covington’s Claudia Harrington makes a move to the basket against Bethel Thursday. 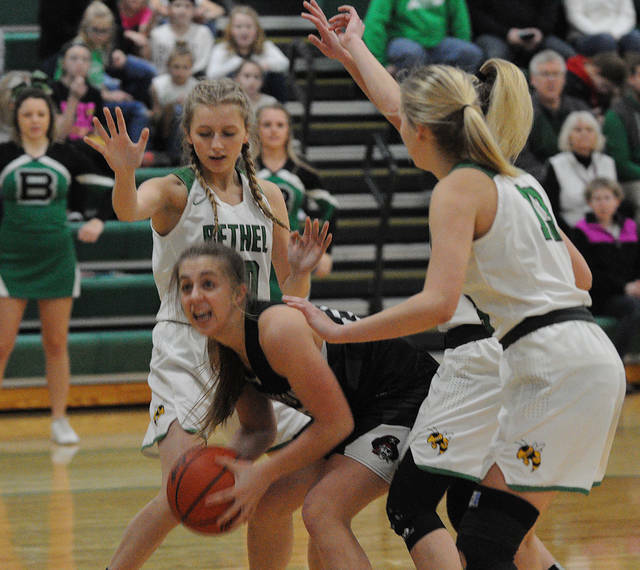 https://www.dailycall.com/wp-content/uploads/sites/30/2019/01/web1_olivia-2.jpgRob Kiser|Call Photo Bethel’s Olivia Rettinger is pressured by Covington’s Morgan Kimmel Thursday night at Bethel. https://www.dailycall.com/wp-content/uploads/sites/30/2019/01/web1_bethel-photo-1.jpgBen Robinson|GoBuccs.com photo Covington’s Lillian Hamilton showed amazing courage this week.